Originally from Fayetteville, Ohio, Matthew made his way north when he chose to attend Kent State University. 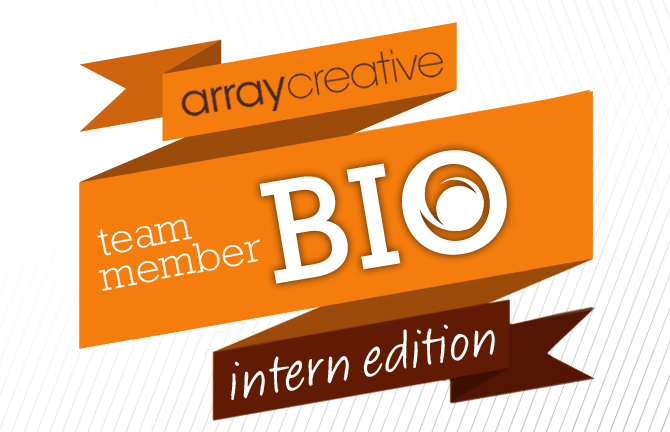 Now as a senior Advertising major, he will be joining the Array Creative team as the spring Marketing Intern! Matthew found his way to Array through this past year’s AAF agency tours (check out our blog from our open house!). Matthew is excited to put his knowledge to work and gain real-world experience. One of the many things he loves about Array is the fact that he gets the opportunity to dive in head first and work with REAL clients. Matthew is eager to learn more about life in an agency, and he’s ready to get started! Nothing beats the smells of home cooking. You can create scent-masterpieces just by using a variety of ingredients and food groups, and that’s really cool to me! Definitely my mother! I still call her whenever I can! I usually stick to a three tone color wheel: gray, blue, and orange. I’ll only count films seen in a movie theatre and that would be “Into the Woods”. Washington DC! I went with my A Cappella group through Kent State and we performed in the White House for the President and First Lady! Surprisingly no. I played soccer for 14 years and kept all my bones in tact. I do get a lot of bloody noses though… so same thing?